I’ve been using awesome and other tiling window managers for a while now. I find it more comfortable when programs are using as much screen space as possible, and I like organizing my open windows in “workspaces” instead of having a huge pile of overlapping windows. Being able to extend the window manager’s default behavior with Lua is also rather appealing. So when a colleague recommended awesome a while ago, I started experimenting with it, and it stuck with me. At first I was using the pre-packaged version of awesome, from the repository of Ubuntu Lucid. Then, as I started learning more about awesome, I installed a snapshot from the ‘master’ git branch of awesome’s development tree. For a while this worked fine, and when awesome started supporting fontconfig, pango and cairo, things were looking quite peachy! My laptop was running Ubuntu Lucid though. This was not something I could change, for various reasons, security being one of the most important ones. So, when awesome’s git version switched from oocairo and oopango to lgi, various things broke. I could compile new git snapshots on Lucid just fine, but running awesome threw a traceback when it tried to load the very old “lgi” snapshot of Lucid. Compiling lgi and all its dependencies manually turned out to be a major undertaking, involving manual compiling of quite basic and central Gnome bits, like gobject-introspection. Replacing half of my Gnome desktop with manually compiled versions was a really bad idea, because it would require a major time and effort investment to keep up with all the fast-moving bits of Gnome. So I switched to another tiling window manager. 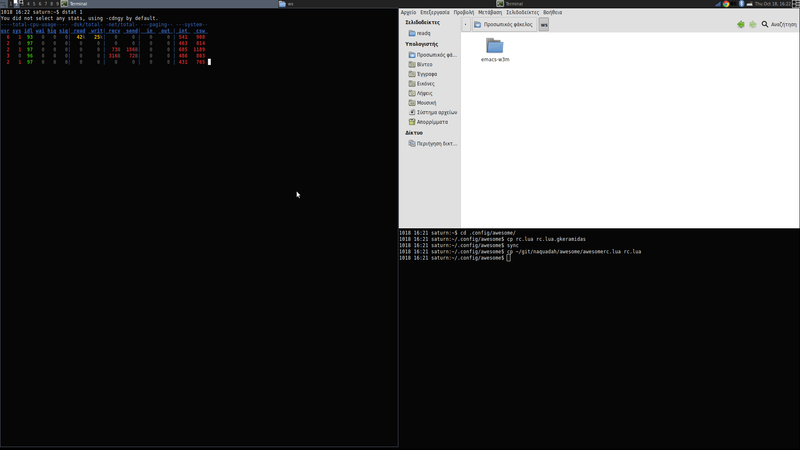 The ‘container’ model of i3-wm is wonderful, but I was missing an easy way to extend the window manager, e.g. to tweak or extend its core features beyond what is supported by the relatively spartan roadmap of i3. 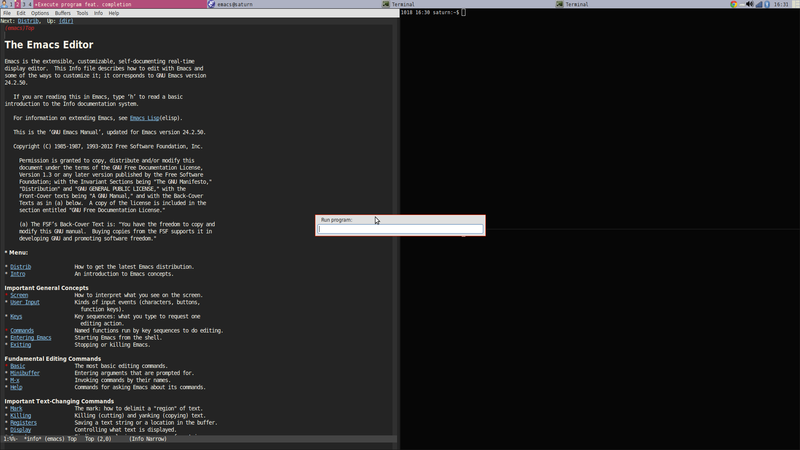 Awesome’s scripting support fills that gap, using Lua for a large part of even the window-manager itself. A small core of awesome is written in C, and there’s a growing library of modules, extensions and plugins. In my not-so-humble opinion, having an extension language instantly makes a program a million times more useful. This is precisely why my favorite editor is GNU Emacs, for example. I’m perfectly happy with this sort of setup. The rest of this article describes how I reached this installed and configured awesome, in the hope that other people who upgrade their machines to post-Gnome2 versions may find this useful too. The first thing I had to do was to make sure that all the dependencies of awesome are installed on my laptop. This will install all the dependencies of the pre-packaged awesome version. The latest development version of awesome uses the same libraries and one more: lgi, the Lua bindings to gnome libraries using gobject-introspection. That concludes the list of awesome and lgi dependencies, so it should be possible to build and run awesome just fine. That’s all. A fairly recent, up to date, clean checkout of awesome’s development sources is now part of my permanent dumping ground of git clones, at ~gkeramidas/git/…. After awesome is installed to the system, some manual configuration is needed to launch awesome as part of the usual Gnome session. I created the following files, copying the xmonad instructions from another blog post. If you have installed awesome in /usr/local/bin/awesome and this directory is not in your default PATH for executables, you may have to replace “awesome” in the highlighted line 5 with the full path of the binary: /usr/local/bin/awesome. 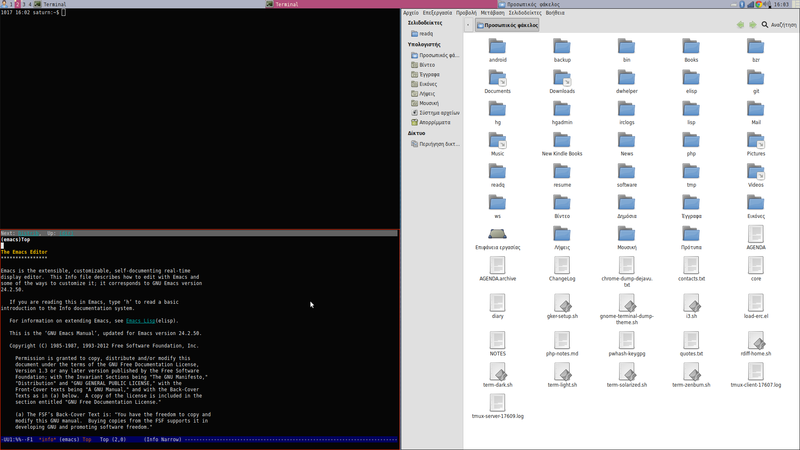 The second file, /usr/share/gnome-session/sessions/awesome.session, defines what to start for a ‘Gnome session’ that uses awesome as the window manager. I use this file to launch awesome as the window-manager and a few useful applets: gnome-settings-daemon, gnome-sound-applet, bluetooth-applet and nm-applet. Everything about awesome’s look and behavior is configured with Lua. This is very similar to what e.g. GNU Emacs does with Emacs Lisp, and it may seem a bit difficult to tweak at first. Fortunately there is a nice default startup file included in the sources of awesome itself. You will find it at awesomerc.lua in the source tree of awesome itself. This cna be immediately copied to ~/.config/awesome/rc.lua and you are ready to go. Incremental changes and small tweaks can then be added on top of the default configuration, to change the behavior of awesome or even to extend it with new features. The rest of the post includes my current configuration file for awesome. This has diverged in several ways from the original configuration in the source tree of awesome, but I’m including it here for your reading pleasure. -- modules are loaded from. confdir = os.getenv("HOME") .. "/.config/awesome"
editor = os.getenv("EDITOR") or "utf-emacs"
-- other programs want to use. Use with caution. -- regularly find useful and want to have readily available. -- Just set the 'terminal' for those applications that require one. -- layout we're using. We need one layoutbox per screen. -- Experimental TAB focus cycling code for Awesome. -- client is the last one, we will pick this one for focus. -- client in the list as the focus candidate. -- one. Pick this one for the focus candidate. -- the first vc item for our focus candidate. -- A function that spawns 'gnome-screensaver-command' to lock the desktop. -- Useful for binding to Alt-Ctrl-L to immitate Gnome's lock key behavior. -- and c.floating at least... maybe more). -- compositing managers when a window is currently tiled. -- Now it should be safe to turn full-screen mode on or off. -- Enable the keys defined in the globalkeys table. -- set as the master window; conversations are slaves by default. -- the normal, default window style. -- fully maximized, so a border doesn't appear useful. -- Some clients are floated by default. -- Signal that is triggered when a client window is focused. -- Signal that is triggered when a client window is unfocused. This entry was posted in Computers, Free software, GNOME, GNU/Linux, Linux, Open source, Software, Ubuntu and tagged Computers, Free software, GNOME, GNU/Linux, Linux, Open source, Software, Ubuntu on 2012-10-18 by keramida. Hey, thanks for the guide! Any idea why I’m getting a black screen with a dialog saying “Failed to load session awesome” after trying to start the awesome/gnome session from login on Ubuntu 12.10? Awesome is installed and works fine when started by itself. Figured it out, I had accidentally saved the awesome.session to a wrong folder!